For 30 years the Kinsmen and Kinette Clubs of Claresholm have been a vital part of the community. On Saturday, March 23, the clubs celebrated their 30th anniversary with a celebration at the Bridges at Claresholm Golf Club. 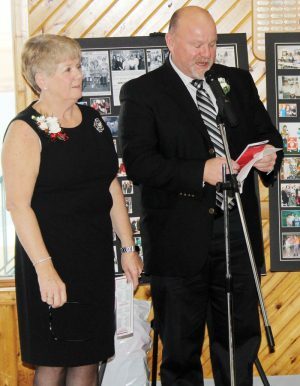 Dale Seeman and Vicki McLaughlin shared the history of how the clubs started, after they read a list of charter members of Kinettes and Kinsmen. Seeman explained an article appeared on the front page of the Local Press on Feb. 1, 1989, and a week later the first meeting was held at Chicken Delite, which is now Roy’s. Don Leonard and Larry McMahon, the owners of Chicken Delite, moved to Claresholm from Saskatchewan where they had been Kinsmen and wanted to start a club in Claresholm. The Vulcan Kinsmen were the sponsoring club. President Ken Hervey of Vulcan and some of the Vulcan Kinsmen led the prospective members through the process, with a projected charter date of April, 1989. McLaughlin said 20 Kinsmen were needed to charter a club. She did not know when the decision was made to also charter a Kinette club, because there was no mention of women to this point. They had 13 prospective members at the first meeting, with 11 seeing it through to charter night. The Stampede City Kinsmen also attended the meeting and left a $200 cheque for Claresholm to get things started. Seeman said in the minutes of March 22, there was a joint meeting scheduled with Kinettes for April, with the High River Kinettes the sponsoring club. The Kinsmen Service Account for Kinsmen for 1988-1989 had bills of $1,430. They had no funds yet so Stampede City, Nanton, Okotoks, High River, Strathmore and Vulcan Kinsmen clubs all contributed to the total of $2,195, leaving Claresholm some seed money of $765. Later there were also donations from Calgary, Didsbury, Banff, Three Hills and Airdrie. “A lot of clubs came together for Claresholm to be founded,” Seeman said. Finally on April 28, 1989 both clubs were chartered with 21 Kinsmen and 10 Kinettes. Currently, there are 21 Kinsmen and 12 Kinettes. From that day on, the clubs have survived through lean years and flush years, and have done many projects in town and supported youth in many groups. Jointly the clubs have sponsored bursaries at Willow Creek Composite High School, national programs such as Cystic Fibrosis Canada and the Hal Rogers Endowment Fund, helped with the Southern Alberta Summer Games starting in 2003, and most recently Claresholm Winterfest in 2018 and 2019. The best joint project of all, McLaughlin said, has been the Kin Trail. “It is an awesome addition to our town,” she said. The two clubs have branched out independently with the Kinettes doing activities such as Claresholm Idol during Fair Days, magic shows, and many ladies’ nights out. Seeman said the Kinsmen have raised hundreds of thousands of dollars over the last 30 years that has all stayed in the community. There have been fun projects such as a trip to the 1997 Grey Cup in Edmonton; hockey drafts; golf tournaments and more. They have also had long-lasting projects such as the Kin playground in Amundsen Park; work on the high school football field including planting trees, building the change room and concession, and installing a much-needed scoreboard and lighting up the field. One of their most ambitious project was the Millennium Ball Diamonds where they worked hard with other community members. In the early 2000s a philanthropist in town wanted to donate large sums of money to the Kinsmen, allowing them to form the Claresholm Kinsmen Charities Foundation. This has enabled them to give this individual and others donation receipts, with the Kin able to decide where the money went. Over the course of the next five years up until his death, they received more than $200,000 from this philanthropist. Seeman concluded by noting through belonging to Kinsmen and Kinettes, long-lasting friendships have been made.